Just found your blog through Southern Hospitality blog. I love what you and your husband have done to the entire house! I was wondering where you got the state artwork in the master bedroom. We are from Montana and my daughters went to college in Minnesota, so love the idea! I love what you’ve done in the entire house! I especially love the color that you painted the master bedroom…so soothing! Thank you so much for your sweet comments about our home! I bought those paintings from a fantastic Etsy seller, Poppy and Pinecone. Here’s a post for more info and links: http://ourhumbleabowed.wordpress.com/2011/05/19/new-bedroom-art/ Elisabeth is fantastic and can make custom pieces, too! I highly recommend her!!! Love this!! You have an amazing eye!! you guys have done an awesome job! did you do all of the wood/mdf work yourself? i love the panels and would like something similar in our new house but i worry that it will make the ceilings look even lower than they already are. thoughts? do you post any tutorials on how you did it? i’ll poke around your blog to check! also, where did you get your basement bathroom vanity? love it!!! Ben built the vanity. Actually, if you wanted something similar, you could use 4 by 4 posts for the corner legs, then install one or two shelves and a few drawers. To reinforce the top, Ben placed a piece of steel under the front edge to support the granite. Oh, and we added 1 1/2 inch MDF facing to the shelves for extra strength. thanks for the info! i think our ceilings are 8 feet. (that’s an educated guess since i’m currently at “work” and can’t get an exact mesaurement!) i was thinking about putting some trim in the master bedroom and/or the main bathroom. we have those fugly baseboard heaters so i’m not sure how that would affect the look of the trim – but i guess anything would be better than the horrendous green sponge paint that the previous owners put in the bathroom! ha! unfortunately (well, i should probably say “fortunately”) there arent any pics of the bathroom on the site yet. oh, and we finally got a couch, rug, and hung some pics so the living room has taken shape since that entry. the sun is shining in boston for the first time in a week so hopefully i can take some updated pictures soon! I love your house! I’m in the middle of making our house ‘home’. While I don’t have a fixer, but new construction, it’s still pretty overwhelming with all the beige. We bought it as our first home, so didn’t have money up front for all the stuff we really wanted, and I LOVE how much you’ve transformed your home! I have been looking for the perfect drum pendant, yours is great! Oh, and the pendant is from CB2 (the Eden) for $50. Such a great price. Such a great job! I’m so impressed-I feel like I’m doing such a disservice to my beautiful old spanish home…need to borrow your hubby for a few projects! All the best and keep up the great work! Your house is freaking adorable and I’m following so I can look back at this when I’m buying a house, can only afford a fixer, and need some major inspiration. Love all the architectural details you added to the walls to death. This is so nice- we’re in the process of updating our home too and I found your site. I was curious where you got your sectional green sofa in the basement? Is it a name brand or custom? Thank you!! Our sectional actually came from Costco, oddly enough. We were just there today and saw the same couch (in a grey/tanish color) for $800 for three pieces. Sorry it took me so long to get back to you. I really love the changes you made to your house. i was thinking of adding some similar wainscoting to our new house. What paint color did you use for the wainscoting? Is it all painted the same shade of white throughout the house? Thanks so much for your sweet compliments! Our wainscotting is all painted in Behr’s Vermont Cream. It’s almost completely white with a small drop of yellow for warmth. Each room is the same just to keep it cohesive. Hope it helps! Love, love. You’re doing an awesome job job! I stumbled across your site via Pinterest and soooo glad I did!! I am in love with what you’ve done in your basement! We are starting the basement finishing process and are stumped about how to lay out spaces/rooms. I love your theater room and office especially!!! Do you happen to have a floor plan of the basement online somewhere? I’m so glad you stumbled on our blog, too! 😉 Thank you so much for your kind words about our house. I just added a floor plan to this page. Hope that helps! If you have any questions, we’re happy to help! I love how you add interest to the bathroom walls with bead board.. We just did that to a breakfast bar. love the look. Your home is bellisimo !!!!!!!!!!!!!!!!! You and your husband have created a masterpiece!!!!! Unique Home!!!! Congratulations! Hi Ingrid! Thanks so much! Hi Nancy! Welcome, and thank you so much for your kind words. 🙂 I don’t know if I’ve posted it anywhere else, but we have about 1250 square feet upstairs and another 1200 downstairs. Fixing up a house is definitely a process. We’ve been working on ours for over five years (that’s since we’ve been married, Ben bought the house 2 1/2 before that!) Good luck with your renovation! Your home is absolutely beautiful. It looks so inviting and warm and you can just feel the love through the pictures. You guys have done such a wonderful job. Okay, I just looked through this tour for the first time and while everything looks great, I cannot believe your basement bathroom looks like THAT. 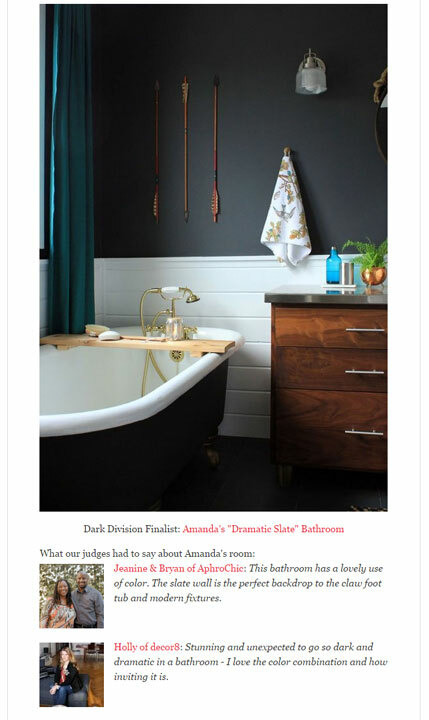 I can’t even imagine my main bath looking that great – ! Wonderful job. Hi TryinginPittsburgh, Aww, thanks! The entire basement was a labor of love (and nearly labor of a baby- I was literally finishing up painting and having contractions. I thought they were Braxton Hicks, but the hospital confirmed otherwise). Wow! You have a gorgeous home! Amanda and Ben. Excellent job at updating everything! One little suggestion for your dining room. By your own admission, the room is very small. Have you considered a built-in banquette along the wood paneled wall? This will give you the opportunity to have a longer table, more seating AND give you about 6 to 12 additional inches of walking space between the kitchen and your table. Beautiful….you guys did a great job! As for storage, each of our bedrooms has a decent sized closet, but nothing crazy. Our holiday decorations are pretty minimal (all our Christmas stuff fits in the same box as our fake tree), sporting and camping stuff is in the garage. We’re lucky enough to have a large pantry in our hall right off the kitchen: http://ourhumbleabowed.wordpress.com/2010/09/06/painted-pantry/ Bulky food is in the pantry and we keep every day food (snacks, canisters with baking supplies, bread, condiments, cereal, etc.) in a drawer in the kitchen. Oddly enough, we have more usable storage space now, with fewer cabinets, than we did before renovating the kitchen. Taking the upper cabinets ceiling to counter has made a big difference. And, the huge cabinet above the refrigerator holds a ton of stuff like extra dishes, a coffee pot, and such. I think having all drawers has made the biggest difference, though. The space is SO MUCH MORE USABLE! (No, not shouting at you, just excited!) We were able to customize the cabinets because we built them so we built everything as large as possible to have the most inside space. It’s also important to note that we live a mile away from a grocery store, so we don’t have stock piles of nonperishible food in our house. If a zombie apocalypse happens, we’ll starve. Haha. If you’re going to commit to tearing down the wall, you might have to purge items. It’s a give/take relationship, but I think the open-ess far outweighs letting go of rarely used things. Sorry, that might not have been the most explanatory answer, but it works for us. If you’ve still got questions, I’m happy to help!! I love your style!!! I feel so inspired, especially by the office. I work from home in a very boring office space. I’d love to update mine to be something that I don’t mind spending 40 hours per week in. I’m very excited to see what you do with your new house. Good luck selling this house, although after looking at the tour I can’t imagine you will have much trouble. AMAZING! The cabinetry throughout your home is gorgeous. I’m so impressed at your transformations! Great job! WOW. So impressed by what you have done! You have beautiful taste! Hi Schoolhouseshakeup! Thanks so much! We’ve done a lot to this little house over the past several years. 🙂 So glad you like it. The best is that after this project you are still together! I’m crazy for all your custom cabinetry, breadboard, and white kitchen cabinets. Anytime your husband wants to come to TX for extra work, I would welcome him. You both created a warm and welcoming, inviting home for your family. Wow what an incredible journey you have made. The before and after photos are breathe taking. Someone may have already asked this question but on the small peninsula in your kitchen there appear to be drawers on both sides. Is this the case or do they only open one way? beautiful job on your kitchen. We have a similar idea for a wall coming down but weren’t sure what to do with soffets….we will likely have to pay someone to refinish the ceiling. I also considered adding open, see through shelving across the top for display pieces. Also interested to know if a new DIY could possibly make cabinets as you did. They look amazing! Oh one more question…..did you redo all your trim around the doors? We have simple moldings and I would love to upgrade them however with something like 18 one just one floor …x that by two since their are two sides to each door…that is a lot of molding!!! LOL Wondering if there is a simple add on we could spruce them up with. Got any ideas? Yep, we changed out all the trim around our doors. But we didn’t do it all at once. Each room got it as we finished it. Of course the hall with all the doors happened at once, but it’s not that bad. Depending on the look of your current trim, you can buy a thin strip of molding (something 1/2 inch to 1 inch wide) and add it an inch or two from your existing trim. Then paint it all the same color so it looks thicker. Hope that helps, but let me know if you still have questions! The changes you made to your home were incredible. I am amazed for every design you do on the whole room. I love the concept of your kitchen, basement especially theater and also the basement bedroom. Really comfortable and a great idea. Your inspiration gives me an idea in the future to renovating the house. For those of you who may be in need of a home builder in terms of renovating your whole house, you can contact http://www.biesterbos.nl and pour in each of your ideas with them, and they will give you an extraordinary feedback. Wow, great job on the upgrades and transformation- bravo!